As illustrated here, a cracked or loose crown can lead to loose brick and deterioration of the brick and mortar joints below. Chimneys are usceptible to other common deterioration problems. Partially because of their exposure to the harsh weather elements, repairs to chimneys are among the most common needs when it comes to brick repairs. Cracked Crowns. Simply as a matter of convenience, chimneys are most commonly finished off with a crown built with mortar, although this practice is clearly substandard.Mortar crowns shrink, crack, and deteriorate prematurely, allowing water to enter the top of the chimney. 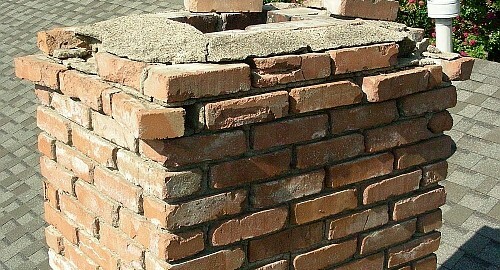 This then may cause brick to pop loose or deteriorate, and contribute to problems with other chimney components and adjoining construction materials. 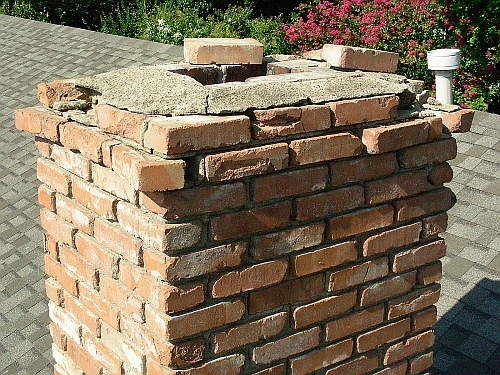 A basic chimney cap that clamps onto the protruding flue liner can be purchased from a hardware store (in season) and installed by the average do-it-yourselfer. Custom caps made of galvanized sheet metal, stainless steel, or copper can be quite expensive, but are designed to protect the entire top of the chimney. Brick Doctor’s custom caps fit like a glove because there are nine measurements made for each one…and they’re securely installed with masonry anchors drilled into the chimney. These handsome caps provide the ultimate protection for both the crown and the flue.